This pile represents documentation of one art project circa 2003. This is already a reduced pile. 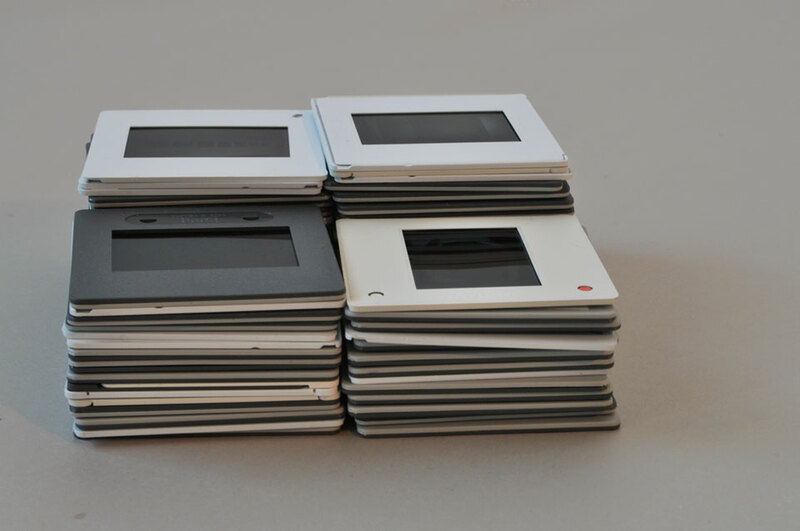 I’ve got about 4 binders of slides (or diapos as I sometimes think of them, that my French friends taught me to say). They are in archival sleeves. Most of them are documentation of work. A lot are duplicates. I have to go through them all and scan the originals (& keep one copy of the real because hey you never know, this digital thing might not work out – or the scanning quality will get better) and then finally make some space. And, oh yeah, update my website with about 75% more portfolio content. These slides aren’t hard to let go of, it’s just the investment of time that is at stake. There is something to be said for the quick scan of a page of slides that is better I think than a web page. And the method. The putting them into the little sleeves, sorting through them, choosing different ones for different galleries, curators, talks, what not. All that is done and dusted. Yup. Time. Deletion. Reorganization. Fantasy of my future.